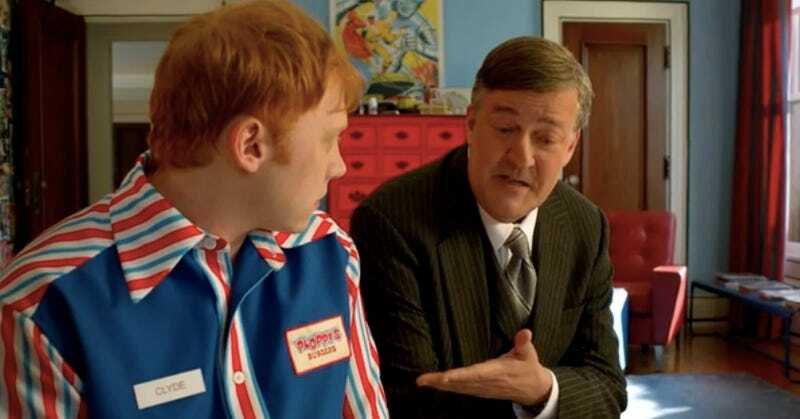 Although CBS didn't pick up Gregory Thomas Garcia's comedy series Super Clyde, starring Rupert Grint and Stephen Fry, the network has posted the pilot online, giving us a look at a very different brand of superhero. CBS execs have explained that the network didn't pick up Super Clyde because it didn't fit in their current slate of comedies, but while the show isn't quite as exciting as the actors attached to it, there's something lovely about this gentle 23 minutes of television. In a sea of television focusing on toxic masculinity, the titular Clyde emerges as a sort of anti-Batman, a slightly maladjusted young man whose first and last instinct is to do nice things for people, with Stephen Fry as his avuncular Alfred with a soft spot for the kindly rich. Grint plays Clyde, the youngest of three orphaned children taken in by their eccentric chemist uncle (who, in this universe, invented Silly Putty). When, years after their uncle's death, the siblings learn that they have inherited a sizable trust, big brother Duke takes up an extravagant lifestyle, one that involves rehiring their uncle's old butler, Randolph (Fry). Clyde, however, doesn't really care for his newfound wealth. He's pretty content working at a fast food joint alongside his sweet but ditzy crush. The money only serves to remind him that he hasn't done anything special with his life. But when he realizes that his uncle wasn't quite the odd duck he seemed to be, Clyde realizes that money may just be the superpower he's always longed for. It's hard to say how Super Clyde would work as a full series, and whether it would use its two leads to their full abilities, but the pilot holds a lot of promise. There are plenty of possibilities in this vigilantism of generous deeds; performing them will help the sheltered Clyde grow up while teaching him that doing good isn't always as simple as it seems. And there's an excellent surprise in Clyde's sister Faith (Justine Lupe). Faith grew up overweight after a childhood spent stress-eating, and the money imbues her with a secret identity that she thinks will let her leave her old self behind. But there's a bit of vigilantism in Faith as well, one that's a bit more righteous and vengeful than what sits in Clyde's sweet and naive heart.